Guest contributors John and Sandra Nowlan offer readers a sneak peek aboard the new Holland America Line Koningsdam where food takes center stage. “I have a passion for presentation.” Rudi Sodamin, Master Chef Consultant for Holland America Line was speaking to a group of us in the Culinary Arts Center aboard HAL’s newest, largest and most innovative cruise ship, the 2650 passenger MS Koningsdam. Koningsdam was launched in Europe in April and moved to a Caribbean itinerary in November. Because of its size we were worried about crowding. But only on the morning of disembarkation did the buffet breakfast area (The Lido) appear particularly busy. 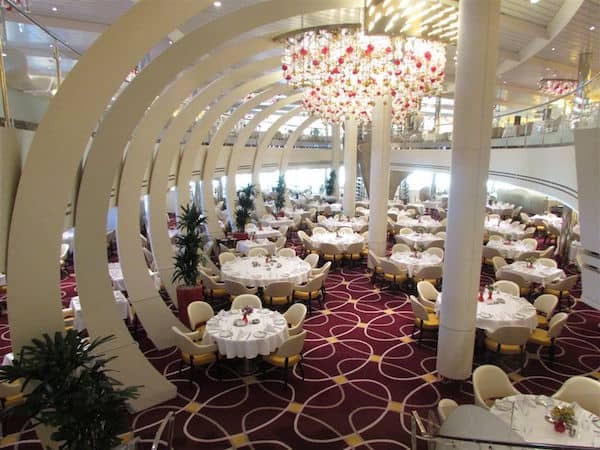 At all other times the well-designed, stylish public spaces and dining areas seemed to have plenty of room even though the ship was full. Holland America Line is known for its wonderful floral arrangements and the bouquets of fresh flowers throughout the ship, with orchids on individual tables in the restaurants, were impressive. Even the carpets in the stateroom hallways had a clever tulip design. The designers of Koningsdam were also clever in the music themes evident throughout the ship. Most of the decks were named for composers (Mozart, Beethoven, Gershwin) and the three-story atrium was surrounded by a giant tubular structure meant to evoke a string quartet. Even more striking was the main dining room with structural ribs (some guests told us they looked like whale bones) inspired by the strings of a harp. Our balcony stateroom was more impressive than most we’ve had at sea. The bed, with fine linens, was very comfortable and there was plenty of storage space. Lighting, including bedside reading lights, was ideal. A 40-inch high definition TV dominated one wall with an excellent selection of on-demand movie channels plus BBC News, MSNBC, Fox News and ESPN. But no CNN. The balcony was very large by cruise ship standards and the bathroom was particularly well laid out with a shower (no tub) big enough for two. The toiletries were high-end Elemis. All large cruise ships have a huge theatre for evening entertainment. Holland America Koningsdam takes the concept in a new direction with its World Stage, a central performance area surrounded by 280-degree seating and dazzling light walls that dance with color and seem to envelop the audience. The troupe of singers and dancers for the two variety shows we saw were very energetic and professional. On one evening the LED light wall displayed dramatic Arctic and Antarctic images from BBC Earth while an excellent orchestra played on stage. But throughout the ship other venues along the Music Walk like BB King’s (nightly Blues) and Lincoln Center Stage (classical music) kept guests well entertained. When Chef Rudi spoke to us in the Culinary Arts Center he showed us where cooking classes were held and the room where microgreens are grown and served fresh each day to patrons. This unique farm-to-table concept is offered for an extra $39 per person and includes an excellent three or four course open-kitchen meal (with recipes available) and as much wine as you’d like. Other extra-cost restaurants we enjoyed were the authentic French seafood brasserie Sel de Mer (a la carte menu), Canaletto for Italian cuisine and Tamarind for particularly tasty Southeast Asia, Chinese and Japanese specialties with a sushi bar. The Tamarind service was very refined and professional as we enjoyed lobster sautéed with ginger and garlic and, for dessert a chocolate shrouded fortune cookie as large as a plate. But the main no-extra-cost dining room also reflects Chef Rudi’s philosophy. While there we ordered a succulent rack of lamb and a superb chocolate soufflé. Several guests told us they ate all meals in the dining room and in the spacious, bright Lido Market buffet. Breakfast choices in the Lido were excellent but the coffee was mediocre. Wine and spirits fans can indulge their passion at Blend (a sommelier helps patrons mix fine Washington State vintages to find the perfect blend) and Notes where 174 different varieties of whisky (and whiskey) are available for tasting at various prices. Koningsdam made two stops during our four-day cruise. In Nassau we took a city tour to enjoy the architecture and British influences on the Bahamas capital. It included a visit to the Ardastra Zoological Gardens with scores of pink flamingos, the Bahamas national bird. The next day we anchored at Half Moon Cay, a private tropical island owned by Holland America Line. Reached by tenders, the island offers excellent swimming, snorkeling, horseback riding, biking and even jet skis. A BBQ lunch is served at noon. We chose a Kayak adventure on Bone Fish Lagoon. Our guide took us across the lagoon for a close-up look at the mangrove swamps and included a stop where we could examine conch shells, starfish and sea cucumbers. A very pleasant couple of hours. Fort Lauderdale has an excellent and efficient port facility but, knowing Canadian weather and airline schedules, we always prefer to arrive a day or two in advance. We stayed very close to the remarkable Bonnet House Museum and Gardens. Preserved close to downtown, the 35 acres of pristine beachfront property include one of the finest orchid collections in the US and the plantation style home of artist Frederic Clay Bartlett. Built in 1920, it’s filled with historic artifacts and quirky art pieces including many of the animals from an old carousel ride. One memorable meal in Fort Lauderdale was at SuViche on Los Olas Boulevard. It has an unusual but very tasty menu combining the flavors of Peru and Japan. The creative presentation and fine taste prepared us for the excellent cuisine we were about to enjoy on Holland America Koningsdam. *John and Sandra Nowlan are travel and food writers based in Halifax, Nova Scotia. All photos courtesy of The Nowlans. Explore the Holland American Line Koningsdam online. Disclosure: The Nowlans were guests of Holland America Line but any opinions expressed in this post are their own. We took Holland America on the Vollendam to Asia years ago and it was great, but the Koningsdam looks to be a big step up. Cruise lines are definitely paying more attention to the culinary offerings these days. I’ve always enjoyed Holland America in the past. Their staff and ships are always top notch. We haven’t been on a large ocean liner in a long time sounds like it’s time to try it again. Wow, Irene. You’re becoming a Queen of the Seas! I haven’t been on a cruise in a long while, and the Koningsdam with its Culinary Arts Centre looks like the perfect ship for me! LOVE the look of the main dining room. Will definitely have to give Holland America a look. The excursion at Half Moon Cay with the BBQ lunch would be really different and appealing. Being responsible for the cuisine on 14 cruise ships was really surprising and ambitious but it sounds like the food is amazing. I find it a bit of a money grab when a cruise line charges extra (ie. $39) for a special dining experience. Granted, unlimited wine. Hmmmm….maybe worth it! Love the design of the main dining room too. They do look like whale bones–like dinner is being served inside a whale’s belly. Thanks for the tour. That main dining room looks quite inviting (though, yes, like you’re in the belly of a huge whale, sort of…). The Koningsdam sounds like the HAL ship one should cruise on!